Thanksgiving is a time for watching the Detroit Lions lose, not thinking. So, we're going to forgo the traditional meat and potatoes QOTD and instead we'll go with a nice cranberry slathered Turkey of the Day. Like this sucker. I don't even care what the excuse is. Marketing exercise, Gumball Rally, owner's a scumball, blindness — doesn't matter. 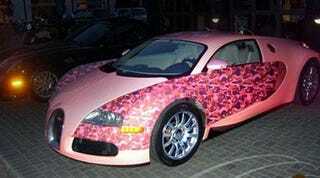 Painting a Veyron pink is abject failure on four very expensive wheels. Adding pink and purple cheetah cammo only hurts humanity more. Cheers to Captain Bumbeck and the StarQuestClub for alerting us to such a stinky bird. Go Green Bay.